Husband and wife were united for eternity in their tomb in Giza, Egypt. In 1907, the tomb was excavated and the lovely 20-inch high clay statues were given a permanent place of honor in the Louvre in Paris, France. 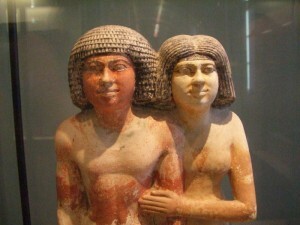 An outstanding example of ancient Egyptian burial portraiture, Raherka is painted an earthy red and his wife, Meresankh is rendered in a yellow tone…coloring considered ideal at the time. The wigs and eye lines are painted black. Look at Raherka and Meresankh’s faces. They are painted without human flaws and are devoid of expression. We have no clue to their personalities or individuality. The ancient artist didn’t want to give us a clue. Belief was that the deceased had to be beautiful and without physical imperfections in order to be guaranteed eternal life after death. 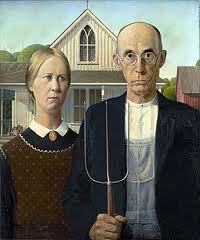 The faces may be devoid of emotion, but the body positions are tender and affectionate. Meresankh’s arm is across her husband’s chest…intimate and protective. Art critics who had favorable opinions about the painting assumed the scene was meant to be a satire of rural small-town life described in literature of that time. With the onset of the Great Depression, the painting came to be seen as a depiction of steadfast American pioneer spirit. Is there yet another interpretation as we plummet headlong into the technological age? Scroll down and leave us a comment. A Botero painting is instantly recognizable! All his people are hugely disproportionate. The women are voluptuous and Rubenesque and the men resemble baby elephants. 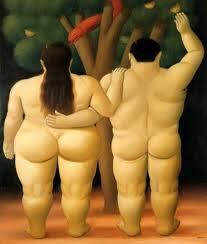 Although we may see a comical, folk-flavored style to his work, underlying that, Botero is quite serious. He grew up in Colombia, a country that has been riven by social strife, civil war, and drug trafficking. When Botero’s son, Pedro, was born in 1970, the paintings focused on phases of family life, from birth to courtship to death. Personal tragedy struck when Pedro died at four years of age in a car accident in which the artist himself was also injured. He then turned to sculpture, and to religious and political paintings. In 2007, Botero painted eighty-five works exploring the reports of abuses of prisoners at Abu Ghraib Prison during the Iraq war. They were exhibited in Europe and two locations in the United States, including Washington, DC. Botero’s art is collected by major museums, corporations and private collectors. A lovely 4th of July to all my blog readers! I am so enjoying reading about you and your art, and in fact art in general. I’m learning a lot and seeing art through your eyes, as I’ve never known much about it. What a joy it is to know you have found this wonderful, God given gift and that you use it to bring pleasure to the rest of us. Come see me if you ever make it to Austin and we can discover our friendship again, from young women to “seniors” and all the changes in between. That’s great that you are enjoying the blog, Jeri! My motto is, “if it ain’t fun, don’t do it!” Hope to see ya in Austin. Kirby, I also get great pleasure seeing and reading your art blog. It’s a fun way to learn some art history about the pieces of art I have enjoyed for so many years. I love the variety of themes and your selection of pieces to share. Some of the comments posted are fascinating and thought-provoking. Please keep sharing your joy of art, and your own work too. I love reading your blog. It is not only educational but it is also well rounded. Instead of focusing on one style of art or period, you give us a mix of everything. Some pieces may make us question whether or not it is really art (one of your previous blogs) but the fact that it does this much, I believe is a job well done. As the old saying goes beauty is in the eye of the beholder. Thank you for giving us the pieces to hold.